Having seen Doubt (opening December 12), I have none whatsoever that Meryl Streep will be nominated for Best Actress in January. You’re probably thinking, “Blah blah, whatever, she gets nominated every year.” Well, the woman can’t help it if she’s genius at what she does. The first time we see her character, Sister Aloysius, in the movie, we only see the back of her head but she’s already intimidating. Garbed in the traditional black nun’s habit as she walks up the aisle of a church during mass, she’s only seen from the waist down as she shushes one kid and thwacks another upside the head for talking. It’s a great introduction to her character, someone who terrifies people even when she can’t be seen. Set in 1964, Doubt is based on John Patrick Shanley’s play of the same name (Shanley also directed this movie) which starred Cherry Jones in a Tony-winning Broadway turn. 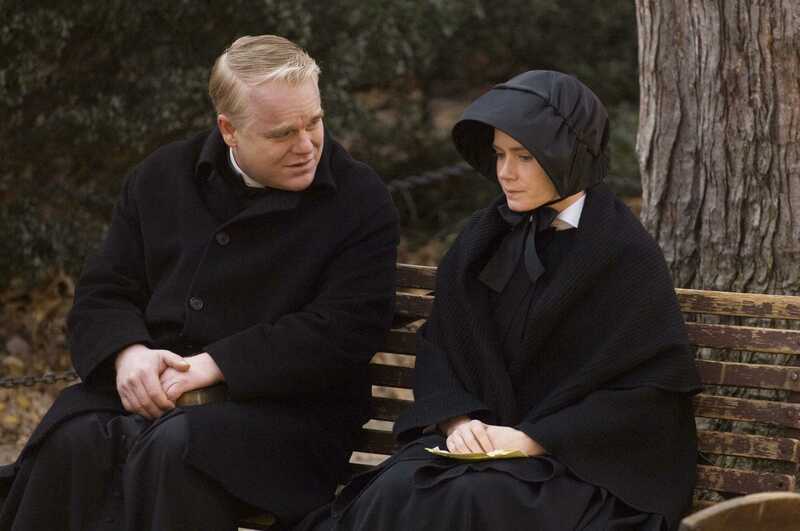 Sister Aloysius leads a solo crusade against Father Flynn (Philip Seymour Hoffman), whom she believes has taken an unnatural interest in the sole black student at the Catholic school they run. Caught in the middle is the young nun Sister James (Amy Adams), who’s convinced Father Flynn is innocent but also admires Sister Aloysius’s conviction. The cast does exceptional work. The trick in Streep’s performance is she avoids making Sister Aloysius an all-out, one-dimensional villain (she’s actually very funny at times). She’s maddening in her ad hominem attack on Father Flynn, possessing no evidence other than that he has long fingernails and likes three lumps of sugar in his tea; ergo, he must be evil. But watching Streep work, I didn’t hate Sister Aloysius. I felt she was a woman desperately hanging on to the familiar tenets of her faith so she can avoid facing the winds of change (literally—strong winds blow a lot in this movie but more on that in the Q & A). I didn’t condone her actions but felt sorry for her because change will come no matter what she does. Adams also turns in a strong performance as the young Sister James. She has got to have the most innocent face on any actress in Hollywood over 15. Her untainted quality shines right through that dark habit she wears. Her work might be subtle but it’s complex; it’s not easy to play such a guileless adult without becoming annoying. Viola Davis, as the black student’s mother, has only about two scenes in the whole film but makes a searing impact as a woman faced with impossible choices. Hoffman does his usual exemplary work, keeping us guessing as to the priest’s guilt. In one scene, though, he might’ve forgotten he was in a movie and thought he was doing the play instead. The scene is a confrontation in Sister Aloysius’s office and Hoffman shouted quite a bit. It would’ve been fine if I were watching him from the back row of a big theater but on film, it was the only time I thought Hoffman was over the top. It’s not hard to mistake this movie for a play, though, because it comes across very much like one. There are long scenes of just two people talking in interior settings with no cutaways. The acting and writing are compelling enough to keep my interest but I imagine the play wasn’t opened up very much during the adaptation process. Most of the actors have only one costume in the movie, the visuals and score are subdued. The minimalism might have been intended to keep the focus on the ideas Shanley presents, themes which are particularly timely in this election year when some people seem to embrace change while others have nothing but doubt. The cast and Shanley did a really entertaining Q & A after the screening I attended. Check back this weekend for my report on that, in which they discussed the film, working with each other and their insecurities as filmmakers. Also coming up this weekend—my review of Australia and Q & A with Hugh Jackman and Baz Luhrmann. Sounds like they got it right with the transition from stage to film. I was lucky enough to witness the great Cherry Jones in the role Meryl Streep takes over in the film. Ms. Jones was a tornado and I look forward to what this new cast does with the material. Can hardly wait for the Q&A!! Thanks!